Hanoi (VNA) – An earthquake measuring 4.5 on the Richter scale struck Kulawi district in Indonesia’s Central Sulawesi province on April 3. According to the Indonesian Meteorological, Climatological, and Geophysical Agency (BMKG), the quake occurred at 11:31 (local time). The epicenter of the quake was allocated at 1.47 degrees southern latitude and 120.08 degrees eastern longitude and at a depth of 10 km. However, no warnings on the possibility of a subsequent tsunami were issued. 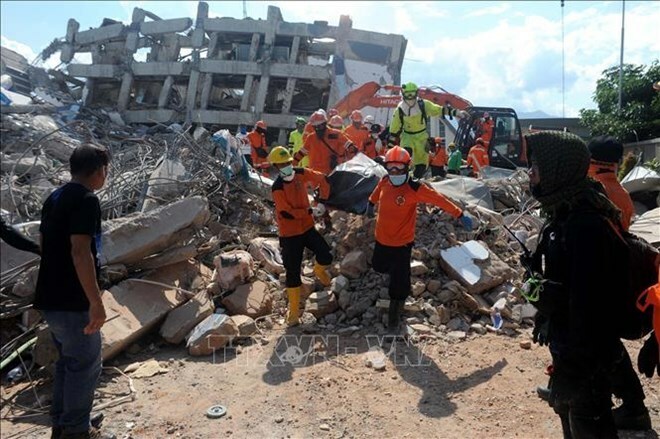 Kulawi is among four districts of Palu city, which bore the brunt of a 7.5 magnitude quake and a subsequent tsunami in September last year. Both disasters left 4,300 people dead and 1,000 others gone missing, injured approximately 11,000 people, and force some 83,000 to evacuate. Their damage amounted to about 900 million USD in value.